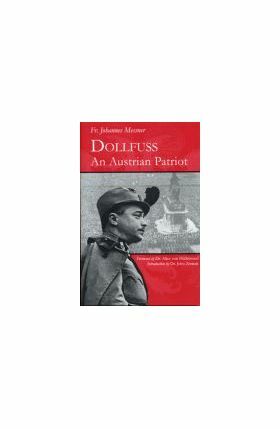 Dollfuss: An Austrian Patriot was written by neo-Thomist professor Fr. Johannes Messner based upon his close association and collaboration with Engelbert Dollfuss, Chancellor of Austria. Messner's account of Dollfuss's life provides a brief sketch of biographical details, but, more importantly, illustrates Dollfuss's social vision and provides an account of his attempt to structure Austrian social and economic life along the lines determined by Quadragesimo Anno. As a leading exponent of Catholic Social Doctrine as it was expressed in the Austrian tradition established by Karl von Vogelsang, Messner is uniquely qualified to highlight the reforms initiated by Dollfuss as they relate to the traditional social vision of the Church. Dr. Zmirak is a student of traditional and Catholic political economy, and the author of Wilhelm Roepke: Swiss Localist; Global Economist. Dr. von Hildebrand is a frequent writer and lecturer on Catholic culture and related subjects. 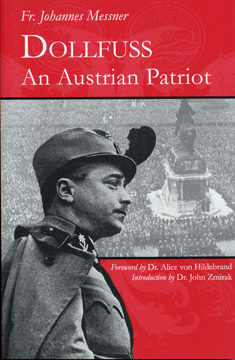 Her husband, the late Dr. Deitrich von Hildebrand, collaborated with Dollfuss and his associates on the paper of the Austrian state, The Christian Corporative State.